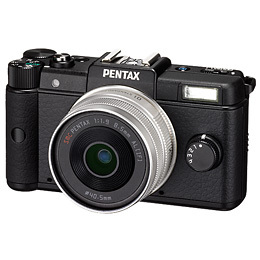 Pentax have started to accept pre-order for their latest “Q”. Featuring a unique Q-Mount, this camera looks like it is going to give the guys at Olympus, Panasonic, Sony & even Samsung a hard time. As of now, I only have the below details from Pentax’s USA site. The Q features the world’s smallest and lightest Interchangeable Lens Camera body. Experience the PENTAX Q. The Camera. Evolved. Newly designed PENTAX Q-mount lens system for specialty Q lenses including prime, zoom, fisheye lenses and more. Exceptional image quality in 12.4 megapixels with a backlit CMOS image sensor designed specifically to produce very low noise at high levels of sensitivity for both 12 bit DNG RAW and JPG files. Surprisingly durable, sporting lightweight, scratch-resistant magnesium-alloy covers. Combines traditional DSLR shooting modes (P, Av, Tv, M) with powerful automatic modes (Auto Picture, Scene). Choose from a variety of creative modes, Smart Effect options or camera settings to assign to the Q’s Quick Dial. In-camera HDR capture mode blends 3 images of varying exposures into a single, highly detailed shot. Full 1080p HD video at 30 frames per second using high quality h.264 compression for superior color and detail. Sensor-shift Shake Reduction system with integrated DRII Dust Reduction for stabilized, blur- and dust-free images, even in low lighting. Large 3-inch LCD monitor features HVGA resolution with 460,000 dots, as well as wide viewing angles. Capture up to 5 FPS continuous shooting mode for fast-action situations. Effortless bokeh control with a dedicated bokeh filter designed to enhance lens depth of field for casual and experienced shooters. New Smart Effects modes enhance digital photography by applying a series of effects to achieve high-quality finishing. Powerful USER modes save a series of favorite camera settings, filters and custom image modes for instant reuse. Shutter speeds range from 1/2000 to 30 seconds with bulb mode. Built-in popup flash with extra-high extension covers 23 feet at 200 ISO. A built-in micro HDMI port outputs video and sound to modern HDTVs. Optional shoe-mounted viewfinder attachment is available for glare-free image composition. 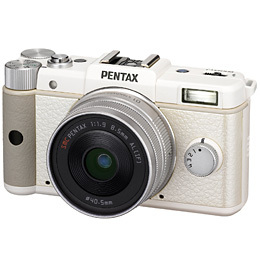 This entry was posted in Brand: Pentax, Photography Articles & Videos and tagged Pentax. Bookmark the permalink.